We have introduced construction technologies that can provide affordable housing and social infrastructure buildings to communities. A complete modular interlocking building system suited for construction by unskilled labour making possible owner participation through self-help or mutual aid. The system has grown to be an inexpensive, quickly and easily erected building system which can be used to construct housing the costs of which consistently undercuts conventional construction systems by as much as 30 to 50%. All the components of the system are cement based compatible components that are fabricated using moulds and machines that can be assembled into different configurations according to the needs of the project or the local market. The production facilities can be set up at or near a project site reducing transportation costs. Furthermore to eliminate the need for heavy and complex construction equipment all of the components have been designed to be lightweight, the heaviest requiring no more than four persons to manually put them in place. 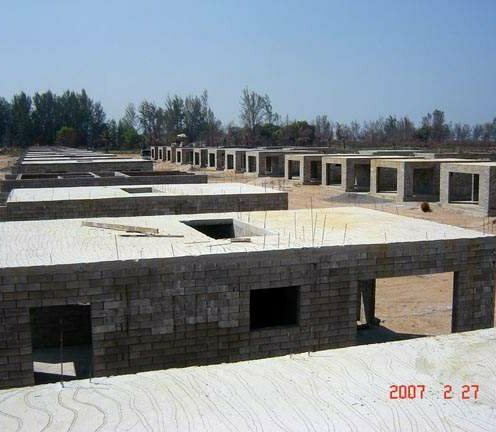 The components produced with the system are: interlocking (no mortar) soil-cement or concrete bricks and blocks for building walls, concrete joists for floor and roof structures, concrete door and window frames, concrete staircases (stringers and treads), concrete rings for double vault aqua privies and concrete roofing tiles. To these basic components specific moulds can be added for pouring foundations, casting floors and beams when required. Because the components are modular and prefabricated under controlled conditions there is no need for cutting or adjusting to put them in place. Their design is optimal in terms of strength and structural characteristics. The moulds and machines to produce the components can be assembled into different configurations creating small to medium scale production facilities employing directly from 3 to 25 persons and capable of producing the equivalent of up to a house a day. When building houses and other such construction projects, why don't they just use a leggo style format ? The Atlanta Housing Authority' or AHA is organized under Georgia law to develop, acquire, lease and operate affordable housing for low-income families. Today, AHA is the largest housing agency in Georgia and one of the largest in the nation, serving approximately 50,000 people.